Opening locks for forgetful people by day, Sathir Khumklung also plays a key role in Pattaya at night, as a police volunteer. The locksmith runs a small shop on the corner of Central Road and Soi Yumei. He’s not actually there much, however, as he responds to emergency calls by people who have locked themselves out of cars and apartments. But at night, he locks down that life and opens another. 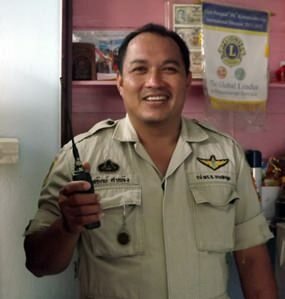 Sathir Khumklung works as a locksmith by day and a police volunteer at night. He’s one of a squad of Pattaya Police Volunteers who patrol from Soi Khao Talo to Jomtien Beach. He sees all kinds of problems, from arguments and fights to burglaries and assaults. As a non-commissioned officer, he can’t deal with all the problems, but still laments how drugs play a part in so many of the incidents. His split personality is now part of his normal life, Sathir said. He loves being a volunteer and serving Pattaya’s citizens.